Fall is finally in the air and nothing says fall to me more than a bowl of chili with some corn bread. I have been making this recipe for chili for quite a few years. It was originally an Emeril Lagasse recipe, but I have modified it so much over the years that now it is basically my own concoction. The only things that remain from the original Emeril recipe are the dry spices and their quantities. The recipe does call for his signature Essence recipe which is included below. 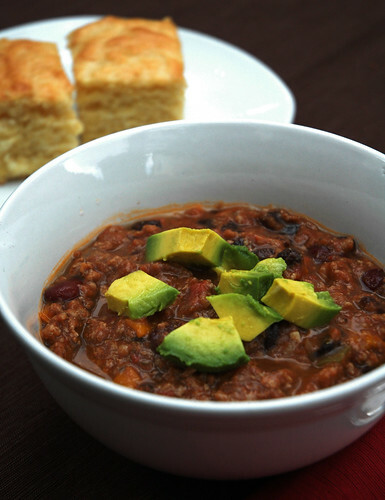 This chili is hearty and slightly spicy. It is also a very healthy meal as it is full of lean ground turkey and lots of fiber packed beans. Both of our girls also really like it (Katelyn calls it chili soup!). The recipe is very flexible and it is easily adjustable for your tastes. Feel free to use whatever beans you like best. One of the grocery stores that we go to regularly carries an organic tri-bean blend of pinto, black and kidney and we find it is perfect for our chili, it allows us to get three kinds of beans and only use two cans. This is one of our favorite meals and we will eat it often during the fall and winter months. You can also top it with all kinds of yummy toppings, our favorite is lots of cheese! Heat the oil in a dutch oven or large pot over medium heat. Add the onions and sauté until soft. Then add the garlic and sauté until fragrant, about 30 seconds. Add the ground turkey and using a wooden spoon break into small pieces. Cook, stirring, until the meat is brown and cooked through. Once the meat is cooked, add the onion, bell pepper, chili powder, Essence, salt, cumin, oregano, and cayenne and cook, stirring, until soft. Add the tomatoes and their juices, beans and water to the pot. Bring to a boil then lower the heat to medium-low and simmer uncovered for 45 minutes, stirring occasionally. Add flour to thicken if needed. *This makes quite a bit, so if you think you won’t use it or don’t want to keep that much stored, you could change the measurements above from Tablespoons to Teaspoons.